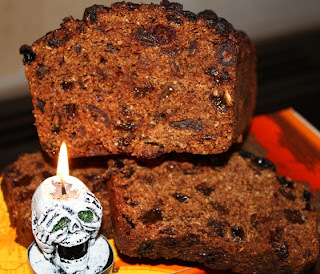 Here's a really easy tea brack recipe, that I adapted and veganised from recipes from Mary in Café Fresh and Nigella too. The only odd thing is that you soak the fruit and sugar in the tea 'overnight'. A few hours will do it though, I find - a minimum of 4 hours. You can wrap a ring in greaseproof paper and bake it in the centre of the cake. Traditionally, the person who finds the ring in their slice of brack will be the next to marry. - Lovely hot, cold or toasted with vegan marg.